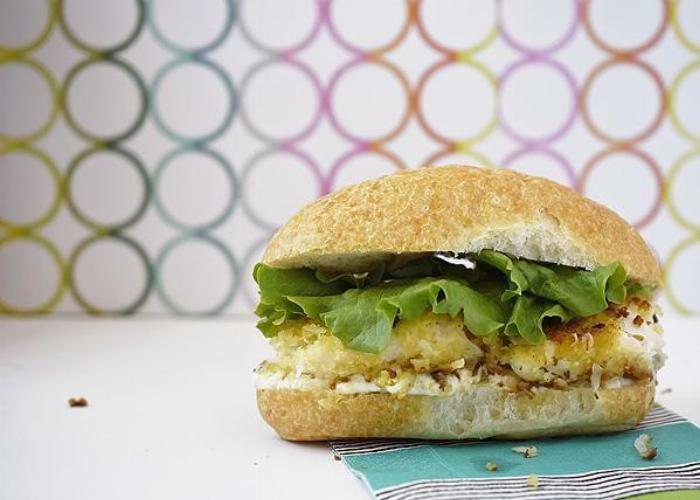 These sweet and spicy, crispy crust fish fillet sandwiches are sure to be a family pleaser! Quick, easy and healthy weeknight dinner option. 1Cut fillets into equal portions, rinse and pat dry. Set aside. 2Beat egg in a shallow bowl. Combine panko crumbs and coconut in another bowl and mix. 3Add olive oil to a fry pan and place over medium heat. 4Meanwhile, dust each fillet with 1/4 Tbsp of chili powder (or Old Bay). Dip into egg and coat. Dip into panko/coconut mixture and coat. Set aside on plate. 5Add to hot oil and fry approximately three minutes on each side, until well browned. Gently flip, adding more oil if necessary. 6Serve on a roll with tarter sauce. Add lettuce if desired.